Bonus Points was all by his lonesome when he crossed the line in the Maryland Million Classic. Photo by Laurie Asseo. Three Diamonds Farm’s Bonus Points, whose last stakes victory came in the 2017 Classic, is one of six defending champions and 13 past winners among 224 horses pre-entered in 11 stakes that help comprise the 33rd annual Jim McKay Maryland Million Day program Saturday, Oct. 20 at Laurel Park. Four of the 12 races on the Maryland Million program, which also attracted seven past Maryland-bred champions led by 2017 Horse of the Year Just Howard, are scheduled to be contested over Laurel’s world-class turf course. Entries and post positions will be drawn Wednesday, Oct. 17. First race post time on Maryland Million Day is noon. This year’s festivities will include the inaugural Clubhouse Festival featuring Grammy nominated headliners Deadmau5 and Steve Aoki. Trained by seven-time Eclipse Award winner Todd Pletcher, Bonus Points spoiled a bid by Admirals War Chest last year to become just the second three-time Classic winner and first to do so in successive years. Now, the 4-year-old Majestic Warrior colt will attempt to join Admirals War Chest, Eighttofasttocatch (2013-14), Docent (2002-03), Algar (1997-98) and Timely Warning (1990-91) as just the sixth back-to-back Classic winner. Bonus Points has made three of his five starts this year at Laurel, winning a second-level optional claiming allowance June 9 and finishing second by a neck July 14 and by a nose in his most recent start going one mile Sept. 16. Multiple stakes winner John Jones, beaten as the 9-5 favorite last year, is among five horses from last year’s Classic to pre-enter, along with Clubman, Flash McCaul and Legend’s Hope. The richest race on the Maryland Million program at $150,000, the 1 1/8-mile Classic for 3-year-olds and up also attracted multiple stakes winners Talk Show Man and Sonny Inspired. Talk Show Man (2014 Turf) is one of seven past Maryland Million winners pre-entered this year along with My Magician (2014 Lassie), Phlash Phelps (2015, 2016 Turf), Item (2016 Lassie), Greatbullsoffire (2016 Nursery), Chapel of Chimes (2016 Distaff Starter) and Who Stole My Sock (2016 Starter). Item and My Magician are each among 22 horses pre-entered in the $100,000 Distaff for fillies and mares 3 and up at seven furlongs including defending champion Crabcakes, Maryland-bred champion 3-year-old filly and sprinter of 2017. Other defending champions pre-entered are My Sistersledge in the $125,000 Ladies for fillies and mares 3 and up at 1 1/8 miles on turf; Spartianos in the $125,000 Turf for 3-year-olds and up at one mile; Participate in the $60,000 Turf Distaff Starter Handicap; and Helloitsme in the $50,000 Starter Handicap. Joining My Sistersledge among 19 Ladies pre-entrants are Miss Disco winner Majestic Reason, second in an off-the-turf All Brandy Sept. 29; Peach of a Gal, winner of the Christiana Stakes June 20 at Delaware Park; Jameela Stakes winner Rocky Policy and Saint Main Event, third in the All Brandy. Most popular among horsemen with 26 pre-entries is the Turf, led by Hillwood Stable’s Phlash Phelps. 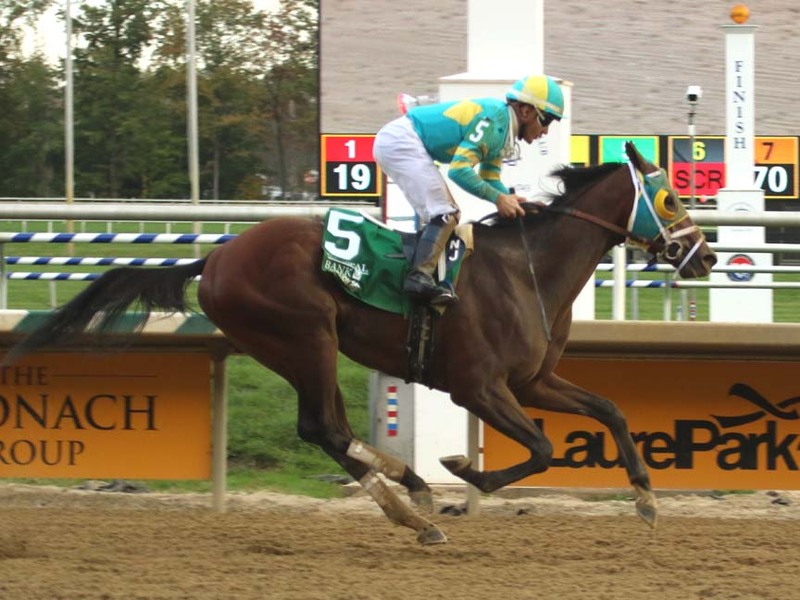 The 7-year-old gelding, who missed last year’s race with an injury, is one of five horses to win it twice and can become just the seventh horse to register three Maryland Million wins, joining Ben’s Cat, Countus In, Docent, Eighttofasttocatch, Mz. Zill Bear and Hall of Famer Safely Kept. Just Howard strung together four straight wins last spring and fall including the Caveat and Find Stakes and Commonwealth Derby (G3) to be named Maryland’s champion 3-year-old and turf horse, but has one win from four starts this year, that coming in an optional claiming allowance on the Laurel grass Aug. 9. John Jones and Talk Show Man are cross-entered in the Turf. Whirlin Curlin and Greatbullsoffire, Maryland-bred juvenile champions of 2017 and 2016, respectively, are prominent among 20 horses pre-entered in the $100,000 Sprint for 3-year-olds and up at six furlongs, along with stakes winners Laki and Lewisfield, most recently second and fifth, respectively, in the Frank J. De Francis Memorial Dash (G3) Sept. 22 at Laurel. Knicks Go, 70-1 upset winner of the Breeders’ Futurity (G1) Oct. 6 at Keeneland, tops 24 horses pre-entered in the $100,000 Nursery for 2-year-olds at six furlongs. He is joined by First State Dash Stakes winner Come Sundown, unbeaten in two starts for Maryland Million’s all-time leading trainer Dale Capuano; and Scrap Copper and Absolved, second and fourth, respectively, in the Laurel Futurity. The $100,000 Lassie for 2-year-old fillies at six furlongs had 23 pre-entries including last out winners Destiny Over Fate, Introduced, Knitted Gloves, Who U Gonna Call and Yours to Keep. Back for the second straight year are the $60,000 Turf Starter Handicap for 3-year-olds and up and $60,000 Turf Distaff Starter Handicap for fillies and mares 3 and older, both at 1 1/8 miles on the grass. Hall of Famers Edgar Prado and the retired Ramon Dominguez share the lead among Maryland Million jockeys with 17 wins apiece.